Leaseholders have been given a model example of how to fight excessive insurance costs following a tribunal victory against the Regis Group. 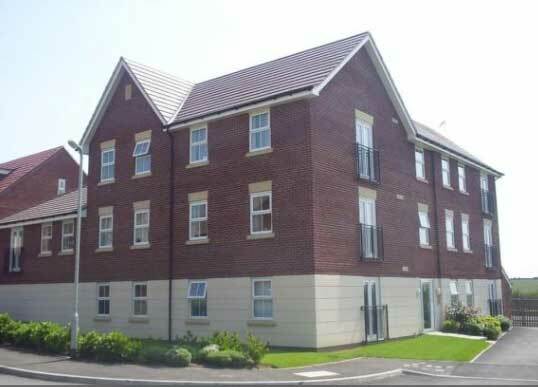 Jeremy Peachey, a chartered surveyor, challenged the £13,000 insurance cost at a 30-flat site in Northampton where the freehold is owned by the Regis Group / Pier Management, the entities of multimillionaire Essex ground rent speculators Nicholas and Peter Gould. The bill has been cut down by two-thirds to £4,364 – and the tribunal made a section 20C order barring the freeholder from dumping his legal costs on the leaseholders. Regis Group, which owns 30,000 freeholds, argued that it bought insurance “on a portfolio basis, not by individual property”. The tribunal said that “it is the ability to bulk buy that enables them to earn a commission of 15% on that portfolio as a whole in return for work done”. A 15% mark up on insurance is a bit of a bargain given usual practices in residential freeholds. Gary Murphy, of Allsops, told at conference – unaccountably and disgracefully – organised by the Leasehold Advisory Service that “commissions can be up to 50% of premium, particularly where a significant level of cover is purchased”. LKP welcomes privatisation of the Leasehold Advisory Service, but why wait until 2020? The Regis Group tried to head off Mr Peachey’s tribunal action with a “without prejudice” offe beforehand, which inadvertently he just added to the bundle correspondence. The case has been reported in Private Eye, which reported that insurance broker Lockton had received a commission of under 5%, invited the question: where did the rest of the commission go, and for what? This prompted the Eye to ask whether the rest of the Regis Group’s 30,000 freeholds could be in line for a refund, too? This over pricing of Insurance Premiums is nothing new. In 2009/10 Peverel Retirement now Firstport Retirement was seen to receive 30.05% commissions along with Oval Brokers and other companies who receive between circa 4.5% to 6%. Recent changes, in our Insurance Premiums increased substantially since Oval Insurance who were the Brokers used by Kingsborough Insurance a Peverel company now Firstport Insurance Services Ltd. Oval sold out to Arthur J Gallagher who decided we were underinsured after a review. Todate a circa 52% increase in two years so much for being open fair and transparent. This increase is unacceptable yet we have not received any proper explanation of why the excessive increase. This figure of £3,791 includes commissions paid. Firstport can expect a commission of 14% (£530). Arthur J Gallagher (broker) may receive 6% commission (£227). We also pay a Premium for Terrorism Cover (based on Post Code) of circa £268 and a commission 4.5% (£12) is granted for this as well. The development insurance and the Terrorism cover are for the same £3.56 million, we pay two premiums for cover yet only one will payout? This is money paid in commissions is a job for the boys as Firstport Insurance who do nothing other than act on behalf of Firstport Retirement and bring in the broker Gallagher. 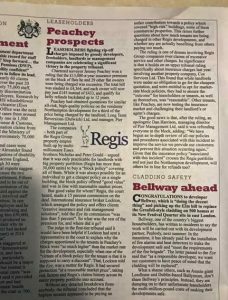 The above examples, Regis group and Firstport, shows a nasty nefarious practice all to common in leasehold and they have been exposed for what they are. Greedy. Thank you Chris this continues the Insurance Scams. I should have mentioned that if this occurs at one development and Firstport have circa 1400 Retirement Developments then multiply commissions at £530, times 1400 is about £7.42 million pounds every 3 years. It is the policy of Firstport Insurance Services Limited (FISL) to tender the block policy renewal now every 3 years, not as was previously every 5 years. However, the power of the portfolio placement has enabled FISL to achieve a rate reduction for some sites whose claims experience warranted it. Any increase in rate is fully justifiable due to poor claims experience or a change in the perceived Terrorism Risk. At the bottom of one the invoices it states FISL do not receive any commission in relation to Terrorism Insurance. Barrett Corp Harrington undertook the Reinstatement Cost Assessment, charging us £537.60 for the privilege. We at Ashbrook Court have I believe an excellent non claim maybe 1 every 2 years and was considered at on time the lowest claimer against Insurance by Kingsborough Insurance which noted we should benefit from the low claims. Also why would Terrorists decide to attack a 29 flat development or maybe they consider us a high risk or we complain to much. I have gone back over the correspondence provided by Chris Owen Complaints Specialist and it seems we now have lost Firstport Insurance who was set up to undertake the Insurance responsibility when Kingsborough Insurance became Firstport Insurance but the Landlords Agent now Estates & Management (E&M) has insisted it stays inhouse and Firstport have been excluded. This exclusion is beginning more and more where the Landlord seems to be happy side-lining Firstport and will allow Right to Manage if it can bring in its mates such as Freemont and Randal & Ritner. Commissions are, as we found out, the icing on cake for landlords as the company receiving the most commission is the company that does the least and acts as an intermediate and only brings in a broker, who then brings in an insurance company, such as Zurich who actually insures the development. 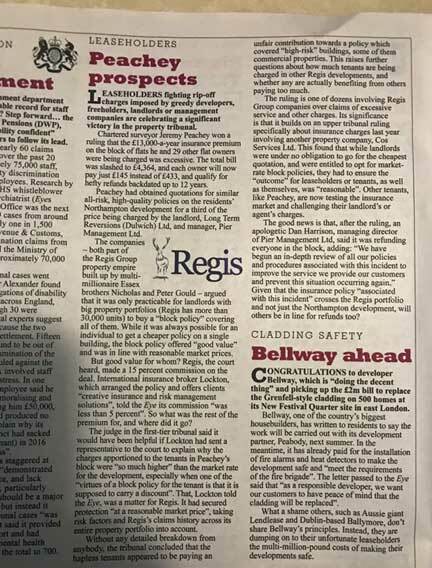 Firstport then Peverel where torn apart in a LVT where Charter Quay in 2012 took them and the LVT stated the company that informs the broker does nothing to be awarded the commission and all the commissions paid were returned. The problem with the LVT now FTT is that if one resident wins a case against the MA each individual has to do the same as the case does not allow the case to be used by the others they each have to take the MA to court. The landlord receives commission, the broker receives commission, and the actual insures receives commission, why, this can be as much as 42%. every three years, for what? Appearances by the Regis Group (Pier Management) before the old LVT and thereafter the FTT-Property are too many to mention. They span many years and can be studied in the archives of the FTT-Prop, which includes previous LVT decisions.as well. However, one such decision (CAM/OOKF/LSC/2010/0133) is of major note as it nails the lie of Dan Harrison, Pier Management, who would have us believe the above case is only an isolated “incident”, which it most certainly is not. In this particular case, Regis was ordered to file and serve details of the claims record of the building, the methods used to obtain insurance and whether any commission was received by the Respondent (Regisport Ltd) or any associated person or company..
As stated by the Tribunal, Regis did not deal with the issue of the claims record at all., and a letter from Pier management (where the writer is unidentified) simply deals with the method of obtaining insurance and, whilst it mentions commission, does not set out the detail ordered by the Tribunal..
At the hearing, Mr David Bland, Pier Management, said he was the author of the statement made to the Tribunal. He confirmed this was a portfolio insurance policy rather than a block policy so that the claims record of each property was taken into account in assessing each premium. It was put to him (by the Tribunal) that the premium first demanded for 2009/2010 was £753.00 per flat; that the premium in the insurance certificate equated to £681.34 per flat and that the demand was for £576.35. He (Mr Bland) could not help with regard to the first amount and could produce no documentation with regard to the adjustment down from £681.34 to £576.35. The Tribunal chair then put it to Mr Bland that, looked at objectively, £576.35 per flat for a semi detached house in a narrow side street in …………………………………….seemed very high. He agreed. The Peachey case as reported by Private Eye is not an isolated incident as Mr Harrison would have us believe. As he well knows, it is but another example of the nefarious trade in which he and his colleagues openly engage, terrorizing as they do gullible and vulnerable leaseholders into making such payments. And this seemingly vast practice demands rigorous investigation. by an appropriate authority as a matter of urgency. “As the Respondent (Regis) did not comply with directions…[t]he Tribunal had to use its own knowledge and expertise. Using that and the evidence available to it including the various quotes, the secret profit being made by the Respondent (Regis) and the admission made by Mr Bland that the premium being charged did seem excessive on the face of it, the Tribunal decides that a reasonable premium in the open market in the normal course of business without secret profits being earned would be £350.00 for each flat inclusive of VAT and insurance tax.”. The MP for Southend-on-Sea must know a lot about the Regis Group and its managing agent Pier Management. Even the local paper in Southend reports complaints against Regis. LPK should ask the MPs in Southend and nearby towns to report on the number of complaints by leaseholders in their constituency on overcharged buildings insurance.